I'm Walking On Sunshine: C'mon! Let's Jump From Space! Falling from space - that was the craziest thing to do, don't you all think? But it was something that the daredevil Austrian Felix Baumgartner accomplished. A record breaking death-defying stunt made in history. Of course, it was something that him and his crew prepared for for months. It was scary because anything terrifying can happen during his free fall jump. Fortunately, according to news, Baumgartner was in freefall for four minutes and 20 seconds and safely landed on the dessert of US state of New Mexico yesterday. It must have been a nerve-racking experience for the veteran skydiver. "When you're standing there on top of the world you become so humble... 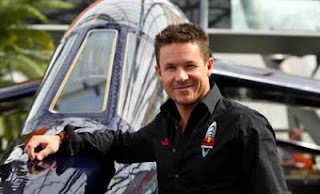 The only thing is you want to come back alive," - Felix Baumgartner. I still think it was crazy! Geez!